Joovy… oh how I LOVE Joovy. I get so excited whenever Joovy comes out with anything new. I was especially excited about the HiLo Highchair. 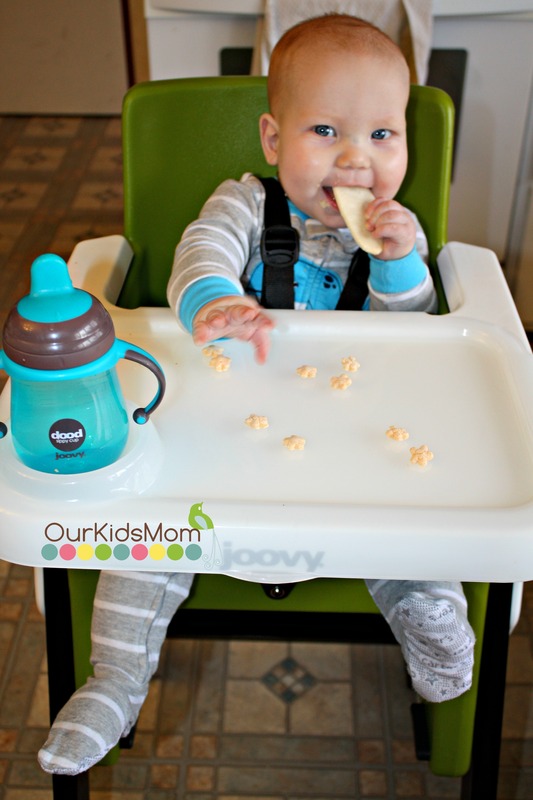 It is such a stylish, fun, and practical highchair that grows with your child from 6 months to 6 years. 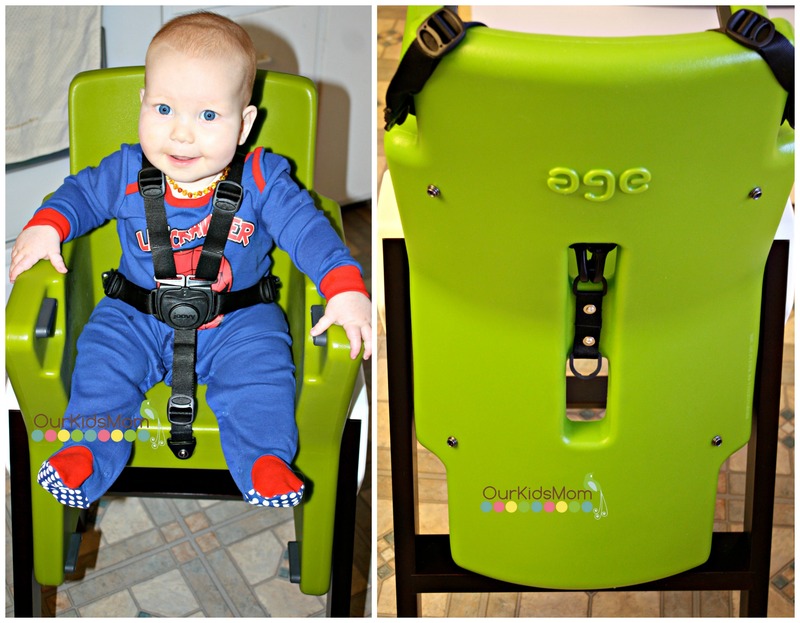 It changes from a highchair to a booster chair that pulls up to the table within seconds. I was given the opportunity to review the Joovy HiLo and was ecstatic. As you can see, straight out of the box there is some assembly required. It was fairly easy, mostly attaching the legs and this took me about 10 min. It was easy and fast. The color combination is just stunning, I absolutely love the combination of the dark wood with the green molded plastic and a little aluminum to accent. I think that alone makes it look like a piece of art. This is a highchair you won’t want to hide away when company comes over. 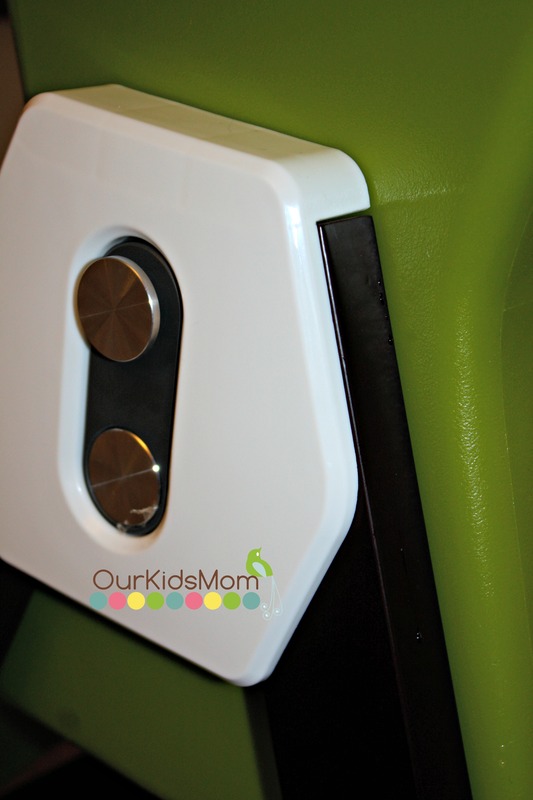 To rotate from highchair to booster and back you pull out the aluminum buttons, push the seat forward and rotate it to either the booster chair or the highchair. It did take me a little time to figure out a way to pull out the buttons on both sides of the chair and give the seat a push forward all at the same time (that third arm that mommies are suppose to have would be handy at this point). I quickly figured out that if I just use my forearm to give it a boost then I can let go of the buttons and easily rotate the seat. As a booster seat my 3 year old daughter loves it and has tried to claim the chair as just hers. After meals she will pull the chair into the living room so that she can sit in it to watch television. 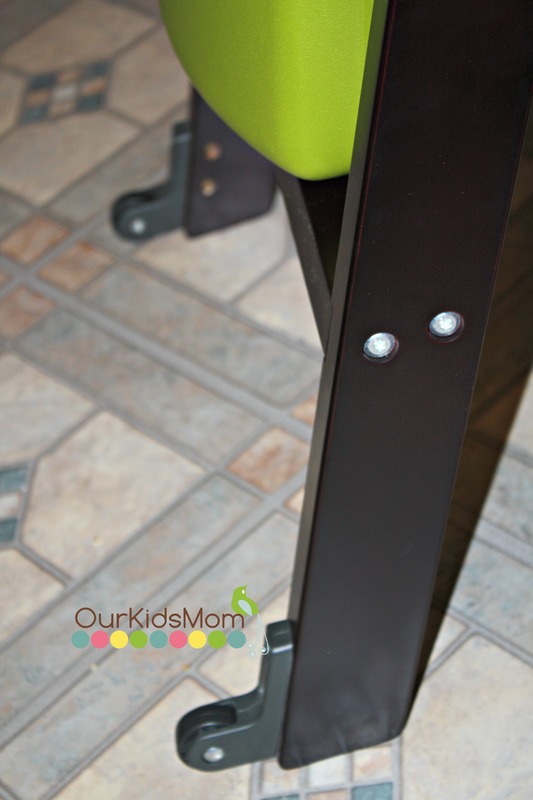 The booster position sits at a lower height so that your child can sit up at the table at a comfortable height. Our table has a lip that prevents the arms of the seat from being able to slide under the table, so I can only pull her up so far. She loves sitting in the chair and now has a favorite chair no matter what room of the house she is in. 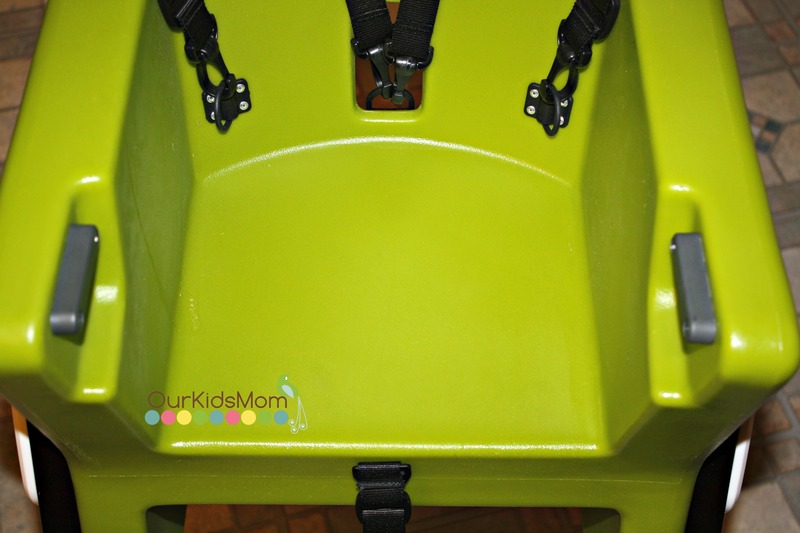 The highchair is equipped with a 5 point harness to keep your baby safe and secure while they are sitting in it. (You can pull the harness through the back hole and thread it through the back of the booster seat so you can have the 5 point harness as well when using the booster chair). The tray slides on in the molded groves and then there are two straps that snap on around the back. When snapped on this tray isn’t going anywhere. I love the tray insert, it makes clean up super easy. When you have those messy meals simply remove the insert and throw it in the dishwasher. It is one of the few inserts that I’ve run across that actually fits nicely in the dishwasher! 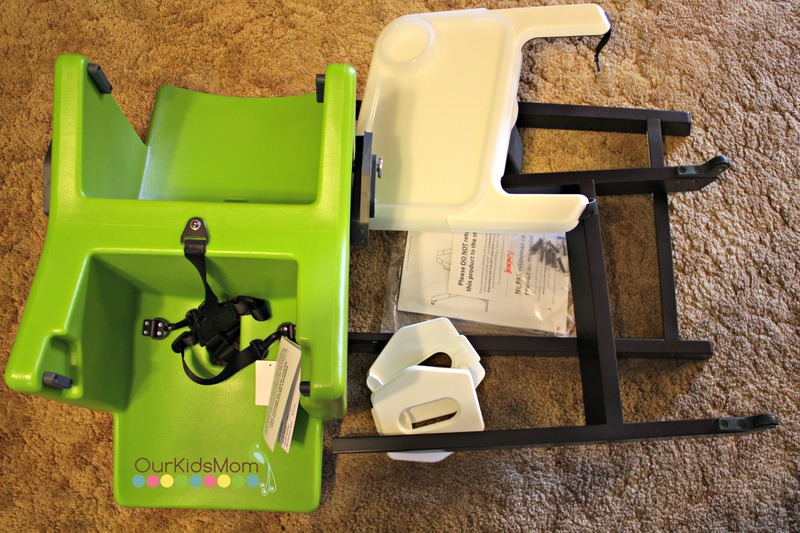 Speaking of clean up, the durable plastic makes this is one of the easiest highchairs I’ve ever had to clean. There are no hiding spots even for the smallest foods. Rice is one that I will still find hiding in our old highchair after being wiped out days later. Well, no more! I actually enjoy cleaning this chair. There are 2 nylon wheels to make moving the highchair around easy without any worries of scratching your floors. I love Joovy for the simple things that they think of. There really isn’t anything that I would change about this highchair. The wood frame is solid and sturdy, and the molded plastic seat is a high quality that it is going to last for years to come. Even passed down through a couple of children, I would say it will look just as good as the day you bought it. I love products that are multi purpose and grow with your baby so you don’t have to keep buying more products as your baby gets bigger. Thank you Joovy for yet another GREAT product! Head over to www.joovy.com and check out the 7 stunning colors that the HiLo comes in. Wow. 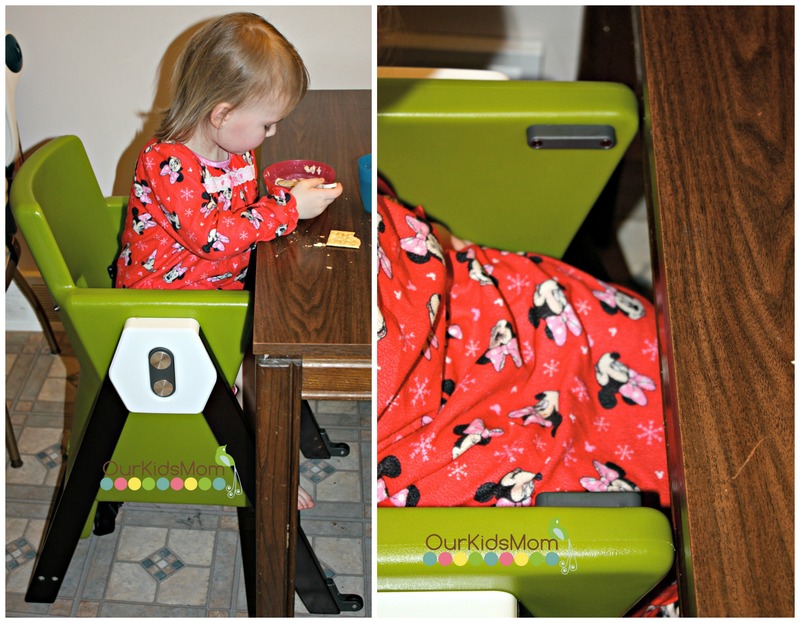 I love that this highchair looks so different! Very modern and clean lines! Such a cool product that I wish was around when mine were little! Yours are just precious BTW. I have heard a lot of good about the Hilo Highchair. We love Joovy products, so I can imagine its a great product! What a good looking baby! Oh – and that high chair, it’s cute, too. I could see how it would last from child to child. This chair sounds great! I love the five point harness. Thank you for sharing. I love basically everything about this highchair: the harness, how it changes with the growth of the child, the tray insert, the nylon wheels , etc. Thanks for the review.